NEW YORK (WABC) -- Get ready to cheer on your friends, family or favorite runners hitting the streets on Sunday, November 5, 2017 for the TCS New York City Marathon! 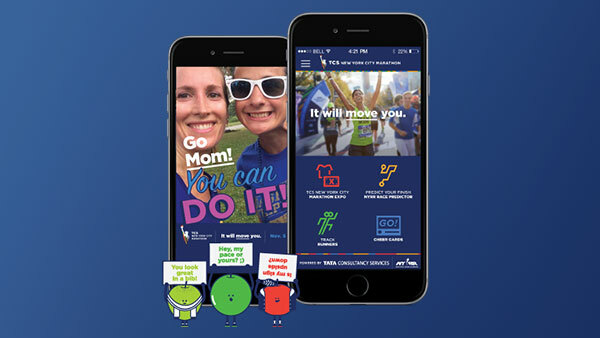 The TCS New York City Marathon Mobile App, powered by Tata Consultancy Services, has implemented a new feature where you'll be able to create supportive spectator signs along the course to give friends, family and fans a powerful way to cheer on their marathoners. After the card is created, share them on social media using the hashtags #TCSNYCMarathon and #MovedMe. Don't forget to tag your runner in the app as well - there's a chance that your cheer card will appear on a new digital screen along the course at 90th street and 5th avenue to give runners that extra boost they need! There's also race-week and race-day events, a FAQ, spectator map, expo map, leaderboards and more on the TCS New York City Marathon mobile app. This November, 50,000 plus runners from around the world call New York City home, and Channel 7 is your home for the TCS New York City Marathon! We have complete coverage beginning Friday, November 3 at 5:30 p.m. with the opening ceremonies. Then tune in for our special countdown to the starting line, Saturday at 7:30 p.m.. And on Sunday, our race day coverage begins at 7 a.m.